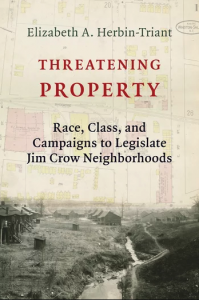 Dr. Betsy Herbin-Triant will give a talk on her new book, "Threatening Property: Race, Class, and Campaigns to Legislate Jim Crow Neighborhoods", on Thursday, April 11 at Bookmarks. Please attend! The Institute for Southern Studies and Facing South are looking for energetic and engaged students for our 2019 Summer Internship Program. The Institute internship is ideal for writers, journalists and researchers with a passion for advancing issues of democracy and social justice in the South. Internships are paid and offer a great opportunity to get hands-on media and research experience that can make a difference. The deadline for applications for summer 2019 internships is Monday, March 25, 2019. Please share with any that you think would be interested or who might know about good candidates! You can find more information about the internship program here. Those with questions can contact intern coordinator Rebekah Barber at rebekah@southernstudies.org.